There are probably as many different non-touch typing styles as there are people who use this method of keyboarding. No rules defining posture or positioning. One finger (usually the index finger) on one hand, called the “hunt and peck” method. Some combination of fingers, usually the index fingers, middle fingers (3rd digit) and the thumbs for striking the space bar. Elbow movement to raise the hand. Shoulder rotation – especially to strike the Enter key. Wrist movement is greater than for touch typing – especially ulnar deviation (ulnar flexion). Some shoulder flexion to reach the number keys at the top of the keyboard. Inexperienced user: will have greater shoulder and wrist movements as they search for keys. Experienced user: subconsciously become familiar with the keyboard and movements become more efficient – more wrist than shoulder and elbow. Non-touch typists must see the keys of the keyboard. This results in frequent up and down movements of the head, as the operator looks down to type, looks up to check what they wrote and then looks down to type again. 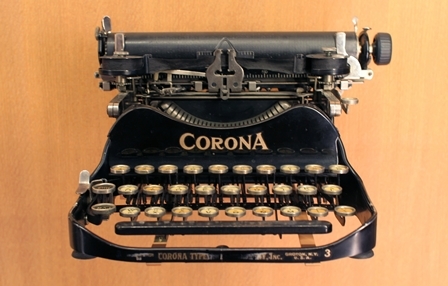 Typing started with typewriters, which are constructed with four tiers of keys, with each tier higher than the tier in front. In front of the first tier is the space bar. Keys are spaced further apart than on a computer keyboard. Touch typing on a typewriter required more shoulder movement and more elbow flexion, in order to reach the higher keys, than it does on a computer keyboard. With the shift to computer keyboards, touch typists who had worked on typewriters had to adjust to a keyboard that was essentially flat. 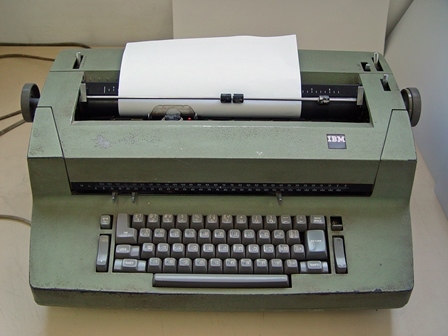 However, to try to approximate the height of a typewriter, computer keyboards had a built in positive tilt (high at the back) and had extendible feet to allow the back to be raised even higher. Keyboard tilt is defined as either positive or negative tilt. The benefits of tilting a keyboard is a source of a great deal of debate. If the closest row of keys (including the space bar) is lower than the furthest row of keys (usually the function keys) then the keyboard has a positive tilt. Essentially the keyboard is getting higher the farther away your hands travel. Most economical keyboards have a degree of positive tilt as part of their design. In addition they usually have extendible feet that allow you to increase the amount of positive tilt. Standard keyboard with built-in positive tilt. Standard keyboard with built-in positive tilt, legs extended. If the closest row is higher than the furthest row, then the keyboard has a negative tilt. Some keyboards have no built-in tilt, with all keys at the same height. Side view of a keyboard without tilt. Most non-touch typists, or hunt and peck typists, must be able to see the keys of the keyboard while typing. The greater the amount of negative tilt the more difficult it becomes for the operator is to see the keys. This does not pose a problem for touch typists, but those who use a hunt and peck system might find that being unable to see the keys creates additional problems. People who type via a hunt and peck method, and who have negative keyboard tilt, have a tendency to lean forward so they can see the keys. This can contribute to neck and other postural discomfort. 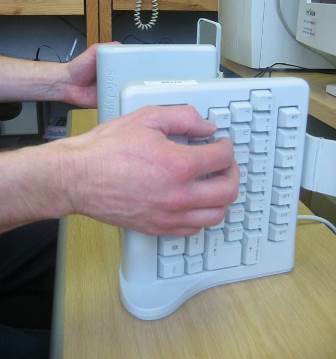 Some keyboards are constructed such that it is difficult to see some or all of the keys while typing. Side view of the Safetype Vertical Keyboard. Two halves of the main keyboard face to the side and are not viewable from the typing position.